Select your name in the top right corner to access your Kapost member profile page. To sign out click Sign Out. To view and edit your profile click View Profile. When you get to your profile, you will see options to edit your profile page. You will also see buttons that allow you to quickly navigate to your default task list and default calendar. Kapost Admins have the system privileges to edit any Kapost member profile. Enter your first and last name. This will display as you identity in Kapost and will be how other users @mention you to communicate around content, ideas, and initiatives. Select Add Photo and choose a file on your computer or thumb drive. Kapost does not allow photos larger than 1 MB. Enter your phone number. The phone number field can only contain one phone number. Enter your email address. The email field can only contain one email address. This is what you will use to log into Kapost. Use the Change Your Password fields to make a change to your current password. All three fields are required. Use this page to set your email notifications settings. To learn how to do this and what each setting means, read this article on notifications. Your connections will display below and allow you to set up your individual social platform connections in Kapost. This is different from the App Center in that only you will have access to these connections, and they are meant to connect to your personal pages. Choose which platforms you would like to connect to and click Connect and Add to Profile. You will be asked to enter your username, password, and any other credentials that the platform requires. 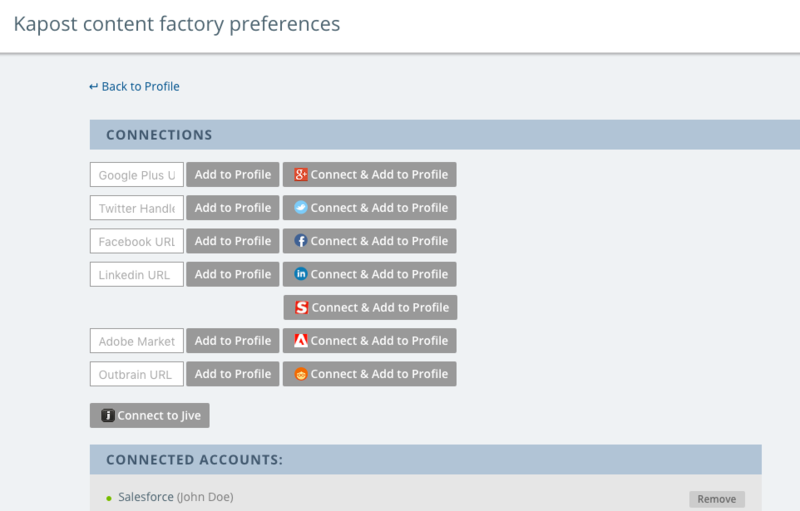 You also have the option of adding the URL's to your profile on these platforms for other users to see. Instance admins have access to their API token, which is located at the bottom of the Edit Profile page. Learn more about your API token here.